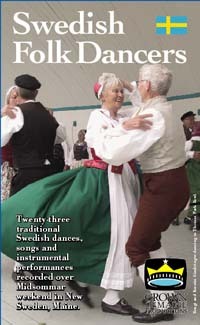 Swedish Folk Dancers is a feast for the ears and eyes, featuring twenty-three performances by dancers, singers and musicians from the Isle of Orust, off the Coast of Gothenburg, Sweden. These twenty-seven dancers and musicians traveled to New Sweden, Maine to perform over Midsommar weekend where their performances were recorded on digital video. These classic Swedish folk songs and dances  from the Wind Mill Dance to the Lang Dans, are presented by Swedes wearing traditional costumes constructed from handmade lace, silk embroidery and hand wrought pewter buckles. Join in the singing and dancing as you watch this hour long video featuring the highlights of a magical Midsommar weekend held against the beautiful backdrop of Maines Swedish Colony in June.